Tham, Jason. 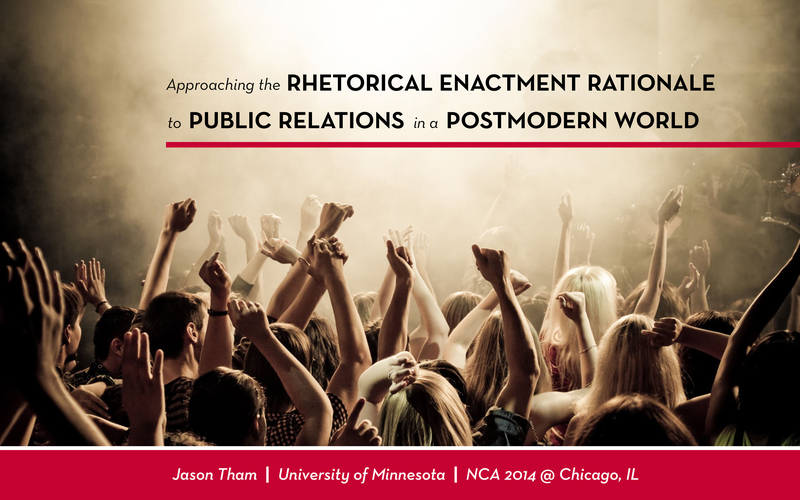 “Approaching the Rhetorical Enactment Rationale to Public Relations in a Postmodern World: A Hybrid Model Manifesto.” National Communication Association 100th Annual Convention. Palmer House Hilton Hotel, Chicago, IL. November 23, 2014. Robert Heath, editor of the Handbook of Public Relations (2001) says that, at its core, public relations is discourse management. He believes that PR can be approached from a rhetorical perspective that studies PR discourses as symmetrical, dialogic actions that add value to the scientific assumptions that are commonly used to explain the processes of communication. As technology constantly evolves, changing the way in which communication is made, acquired, classified, and exploited, our society is in a state of advancement, with “citizens having access to unprecedented computer and media connectivity” (Radford, 2012, p. 50). In 1979, French sociologist and literary theorist Jean-Francois Lyotard recognized that such technological and cultural development has moved the society forward into a new form of “postmodern condition” in which “forms of knowledge and information, and the citizen’s relationship to these forms, are fundamentally different from those that came before (Best and Kellner, 1991, p. 3, qtd. Radford, 2012, p. 50). As Heath and other critical scholars noted, public relations holds a significant role in the creation and dissemination of information in the contemporary world. According to Derina Holtzhausen, public relations today remains in “management practices based on modernist principles of command and control” (2000, p. 93). Following this statement, Holtzhausen seemed to suggest that public relations practice today is “out-of-step” in the postmodernist society, which constitutes multicultural, multiethnic, and multi-gendered publics (2000, p. 93; Radford, p. 50). The rest of my presentation will discuss the implications of framing discussions of public relations in postmodernist expectations and explore ways in which Heath’s rhetorical enactment rationale fits into a postmodern understanding of the publics. The knowledge claims of PR work with a modernist sense of a singular reality that can be described, understood and ultimately exploited. Practitioners must work on the assumption that human behavior is the result of rational thought and irrational drives, and that the appropriate manipulation of those faculties will produce responses desirable to the sender. (p. 55). Theoretically speaking, the assumptions of a positivist scientific method to practicing public relations contradict with the expectations of a postmodern society. According to Radford (2012), in the postmodern condition, as societies become more pluralistic, messages experience stronger competition across aspects of communication in the society. Framing public relations discussions within a postmodern perspective means to forgo the modernist principles of command and control. A postmodern treatment of public relations is not prescriptive, but rather transcend the interests of the practitioner to play interests in the society’s metanarratives. A postmodern treatment of public relations “must self-reflectively stop privileging the notion that PR is about the management of communication and the search for best practices that inevitably lead to some idealized best solution” (Radford, 2012, p. 64). This context of prioritizing metanarratives that structure social and cultural environments opens up a new space for implementing Heath’s rhetorical enactment of understanding public relations. Based upon the notion of postmodernism, a hybird model for approaching public relations is created to outline how and where postmodern expectations and the rhetorical enactment rationale intertwine. The hybrid model consists of three postmodern-rhetorical conditions derived from Heath’s rhetorical contexts. These conditions seek not to generate a list of techniques for enabling public relations practitioners to be more effective, but to shed light unto a discursive world that differs from a modernist perspective. In postmodern principles, metanarratives serve to make the message recipient aware of the fictionality of the message and sometimes the presence of the sender. A postmodern assumption of public relations is there are competitions among narratives. A postmodern treatment to the rhetorical enactment of public relations assumes the messages created and distributed by practitioners “are inevitably received and interpreted in the context” of competing perspectives and interests (Radford, 2012, p. 60). It thus forces practitioners to consider critical counteractions to better understand their diverse audience and competition, and to create a shared understanding of meanings. As the rhetorical perspective presupposes the importance of building and maintaining marketplace relationships, the postmodern enactment takes it a step further by urging public relations scholars and practitioners to move beyond the notion that public relations is about managing communication and communities. A postmodern view of society agrees with Heath’s perspective of a “multipublic, multimarket, and multiaudience” community (2001, p. 47). With advancing technologies and passage of time, a postmodern view assumes that these active groups are constantly growing and diversifying. A postmodernist expectation further challenges public relations practitioners to fabricate a participatory culture among the ever-evolving groups in the society. Cultural constructs are the essence of public relations practice. As culture informs the basis of a society’s shared meaning system, “it provides the classification schema we use to make sense of our world, making culture, meaning, and language inextricably linked” (Curtain and Gaither, 2007, p. 36). Additionally, a postmodern condition of a society is its shifting identities and subjectivity. Identities in postmodern assumptions are “social constructions emerging from discursive practices (speech acts), and they form in relationship to something else” (Curtain and Gaither, 2007, p. 168, elaboration added). And because each individual member of the society interacts within a number of social systems, identities are never stagnant; people assume different social roles and cultural classifications, subjecting themselves to various representations of the self. Due to such fluid identities, the experience of a subject in a postmodern condition, surrounded by multiple realities and information coming at them from a myriad of sources, is “seduced into a hyperreality” that is constituted by mixed texts and representations (Radford, 2012, p. 60). A postmodern-rhetorical model for public relations assumes that representation of an event is just as important as, if not more so than, the actual event. A key distinction in this insight compared to a modernist principle of control and command is that it no longer matters what the messenger says, but it is what has been heard and perceived by the audience that counts. To better understand principles underlying the postmodern-rhetorical model and how it can be used to guide discussions in public relations and its practices, I will use an award-winning campaign to introduce each condition described before to show the hybrid model in action. In 2010, American Express created Small Business Saturday, a new shopping day between Black Friday and Cyber Monday, to support small businesses nationwide (Facebook-studio.com, 2012). In 2011, the brand decided to turn this grassroots campaign into a permanent fixture on the American calendar. The first step to achieving this goal was for American Express to situate itself among the metanarratives about holiday shopping and small business entrepreneurships. Since meanings are presupposed to reside within the discourse community, American Express needed the marketing to come from the people, not from the brand. They did so by launching a marketing campaign that included social media strategy and media relations to articulate the reasons and means to activate various local audiences to carry out the marketing for them. This strategy leveraged the American Express’s brand voice from its competitors. As a result, the holiday generated over 1.5 billion earned press impressions, and according to Facebook Studio (2012), three times on November 26, 2011, “#SmallBusinessSaturday” became a national organic trending topic on Twitter. Using social media tools such as geo-targeted Facebook Ads and digitally activated storefronts with customizable QR-enabled signage, the public audience was empowered to join the ongoing conversations in the campaign. According to Facebook Studio (2012), the campaign measured 350% increase in social buzz from 2010, and public awareness nearly doubled to 65% from 37% in 2010. As the grassroots campaign was made to promote local shopping, more than 500,000 small business owners felt they have more skin in the game and so leveraged the promotional tools American Express provided to advocate for their business and spread the word about the big day. So while American Express established a hub for the movement, it was really its participants who made it a success. In the Small Business Saturday campaign, American Express augmented social actions to scale. From Facebook to YouTube to Foursquare, American Express put out online and offline platforms to amplify small business voices for their audiences. The key of this campaign was to decentralize and mobilize shoppers to make them feel as though they were shopping for a cause together, but in their own local business communities across the country. A website was set up to ask Americans to pledge to make a purchase at a local business. Consequently, 103 million Americans shopped on Small Business Saturday 2011, including President Obama and his daughters. American Express also saw cardmembers transactions increase 23% at small merchants on the day (Facebook-studio.com, 2012). More importantly, a resolution supporting Small Business Saturday was passed by the U.S. Senate unanimously. The overview and the case have illustrated how the postmodern-rhetorical enactment model can inform public relations practices. Some clear lessons emerged from this case study include: 1) there’s a need to situate an organization’s voice in a leveraged field to rise among metanarratives; 2) the most rewarding relationships are ones that directly involve the participants, not just the decision makers; and 3) pseudo-realities can lead to spikes in community participation if they are managed delicately. The framework presented here is meant to provide an alternative, theoretical model that suggests critical evaluation of current public relations practices and invokes different approaches to discussing public relations in a postmodern world. The hybrid model seeks to promote an appreciation for postmodernist expectations in our society.